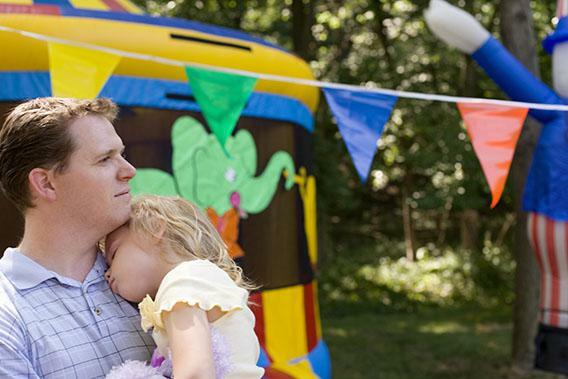 Life as a stay-at-home dad: Everyone I meet calls me a hero for taking care of my kids. I’m also not baby-sitting them. I’m their dad. I can be your hero, baby—just by parenting you, according to strangers. At the zoo, my 3-year-old daughter whines about wanting hot cocoa. On my lap, my 9-month-old infant shrieks, too tired to eat and too hungry to sleep. I feel for her. Actually, I’m right there with her. I glance up in exhaustion and see an old man grinning at me from his place in line at the zoo’s coffee shop. Now, I’m 6-foot-2, 250 pounds, and have a shaved head. My brow owes more than a little to the Cro-Magnon, and I don’t shave very often. I look, in short, like a burly Serbian nightclub bouncer. The old man is grinning at my wailing offspring and me anyway. And I want to throw the half-empty carton of chocolate milk at his head. It so happens I’m alone with one or both of my kids—9-month-old Sadie and 3-year-old Anna—at least 50 hours a week. It so happens every day is Daddy’s day with the kids. People are still talking about “mommy wars,” 25 years after Child magazine first coined the term to describe the clash between working and stay-at-home mothers. “Why Women Still Can’t Have It All” was probably the Atlantic’s most controversial cover story last year. And earlier this week, the New York Times ran a lengthy profile of a working mother fighting not for the corner office but for more flex time, with barely a mention of her husband/child-rearing partner. No matter how many dads you might see at the late-morning singalong, the default thinking remains: Moms are the primary caregivers, whether they work outside of the home or they don’t. Well, it’s not the default in my house. My wife, Jen, spent six months with the kids while I was working full time, and now I’m spending six months with the kids while she works full time. For a number of boring logistical reasons, this was the best decision for us financially. We’re just trying to allocate our resources in the smartest way possible. Wanting to make babies and take care of them is fairly standard to the biological blueprint of both men and women. Trying to do a good job raising your kids is also not wildly uncommon. That one partner might need to remain with the kids while the other forages for money or berries or mastodon meat—this, too, is standard biological stuff. Especially in lean times. And, as it happens, we live in lean times. I’d love to put my kids in day care five days a week, but we don’t have the extra $30,000 a year that such care would cost us here in Seattle. The following month, as if on cue, Esquire ran an endlessly long story called “Why Men Still Can’t Have It All.” Instead of posing difficult questions, Esquire seemed eager to complain about women complaining so much. The author, Richard Dorment, wrote that “among those who traffic in gender studies, it is something of a truth universally acknowledged: Men are to blame for pretty much everything.” The other take-home was that men have it really, really hard. Dorment cites studies that show that in dual-income households, men spend more time working outside the house, and the same number of hours as women at household tasks. Yes, apparently men are being exploited. Later, at the grocery store, Sadie’s in her car seat asleep in the cart and I’m carrying Anna, who is rubbing my jaw and saying, “Scratchy!” and then rubbing my head and saying, “Soft!” It’s a game. Last year my debut novel won the Washington State Book Award, and my second book will be out next year. I teach writing at night. But this is what my days look like now. I spend a lot of time thinking about diapers, nap schedules. I spend a lot of time trying to put clothing onto the bodies of very small human beings who are thrashing around and screaming. At the grocery store, I look up and a woman who’s lurking by the dried pasta is smiling at Anna and me. “She clearly adores you,” she says with her Mother Teresa eyes squinting benevolently. I nod. I want to say that whether or not she likes me, my daughter spends a lot of time howling in sorrow at how infrequently she gets to eat cake. I want to tell her that this little angel—who was completely potty-trained a couple months ago—recently started peeing on the bed my wife and I share when she’s upset, like a dog marking its territory. But of course this person doesn’t want to hear about that. This person is cultivating a narrative about my child and me, and she wants me to participate. “You’re a hero,” she says. I muster a halfhearted smile and walk away. “Who was that?” my daughter whispers, still rubbing the side of my head. “I’m not sure,” I mutter, scanning for canned tomatoes, one of the two items on my list. In Seattle, where the rain pummels us daily for 10 months of the year, these cavernous grocery stores are an OK place to get the kids to walk miles. I’m not the only parent who spends hours here only to leave, at last, with one jar of olives. “I want a donut,” Anna says. More or less every week, a stranger informs me that I’m a “hero” for taking care of my kids while their mother, my wife, is at work making the money that we require to continue living in the manner to which we are accustomed. Never in my life has anyone put the word “hero” anywhere near my name, and at first I was delighted that all these people were so impressed with me. Then I noticed that a lot of people also often referred to me baby-sitting my kids, too. The implication was that it was baby-sitting when I had the kids, but when Jen had them she was merely being a mother. It goes without saying that when Jen was with the kids for her six months, no one ever stopped her in the grocery store to tell her she was a hero. “Not once?” I asked her recently. She just gave me a look that said that if I even had to ask that question, I was hopelessly naive. Of course not. Whereas I can barely leave the house without someone levitating toward me bearing that grin. They often shake their heads slowly and stare at the baby for a weirdly long time, wincing as if she were both painful and pleasurable to behold. If the baby is in a calm zone because we’re far enough from her next nap or feeding or bowel movement, I’ll sometimes fork her over, at which point the stranger raises her up like a holy chalice. My toddler and I then usually exchange a look that goes something like: Ugh, when can get back to sprinting laps and playing hide-and-seek in the mostly abandoned garden section of this grocery store? Yes, taking care of kids is difficult and it is underappreciated work, especially if you’re also nurturing a career. But it’s not heroic. Because, if it’s heroic to forgo working so that you can take care of kids, then what if you have to work to provide for those kids? Is my wife un-heroic—maybe even a coward—for passing the kids to me so that she can return to work full time? What about me? Was I lacking in heroism before, when I was working long hours and she was with the kids? I’d like to humbly suggest that I’m not a bad or good person based on my position with regard to this particular question. I don’t feel guilty or proud of how much time I spend with my kids now, and I didn’t feel guilty or proud when Jen was on maternity leave. I wish that Jen also didn’t feel guilty or proud about this issue, but I know that as a woman she is inundated with judgments. I get judgment, too, I suppose: I’m accosted by strangers who want to praise me because I’m with my kids at noon on Tuesday. But when I was working around the clock and Jen was with the kids, people applauded my ambition. I’m a hero either way, which is nice for me. I suppose this is preferable to being a wimp. Certainly, especially to older generations, there’s an emasculating connotation to a man taking a break from his career to raise children. The dreaded implication—which is accurate in our case—is that his wife has more earning potential than he does. The novelty of that scenario is quickly becoming unremarkable. The New Republic even thinks the “daddy wars” are coming. Maybe it’s because of this shift, or maybe it’s because I look like such a brute, or maybe it’s because I remain moderately active as a writer—I earn two-thirds of what Jen makes as a high school English teacher, but just surviving in this beleaguered profession is now widely viewed as a coup—but no matter what I do, I can’t seem to get this thing wrong. Meanwhile, Jen is always wrong. At home with the kids, she’s an anachronistic housewife; at work, she’s ditching her kids to nurture selfish professional ambitions. Somewhere, lurking at the root of this all, is the tenacious idea that men should have a career, whereas women must choose between a career and being at home. The reality is that no parent I know—regardless of gender—has the luxury of making a choice about how he or she will balance the demands of work and childcare. The decision isn’t heroic or cowardly. It isn’t even a decision. No, this here—this is economics.